BMW of North America announces the ChargeNow DC Fast Expansion program in cooperation with EVgo.As part of its ongoing commitment to the growth of a robust public DC Fast charging infrastructure, BMW is supporting EVgo’s installation of an incremental 500 DC Fast Combo chargers, to benefit i3 customers and all EV drivers in the US with DC Fast Combo charging capability. ChargeNow DC Fast also includes two years of no-cost charging for qualifying BMW i3 drivers in those areas. 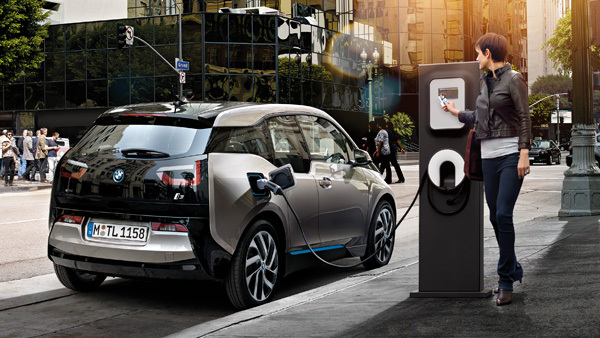 Eligible BMW i3 customers in ChargeNow DC Fast markets, who purchase or lease the BMW i3 on or after November 1, 2015, from a BMW i Center can enroll in the program. Program participants can enjoy unlimited no cost 30-minute DC Fast Combo charging and no cost 1 hour Level 2 charging for their BMW i3, at EVgo Stations, for 24 months from date of enrollment at chargenow.com/us. Customers use the complimentary ChargeNow cards (included with the BMW i3 vehicle) to access the no-cost charging sessions. With the growth of EV sales, there is increasing demand among drivers for more publicly available, strategically located DC Fast charging stations to facilitate longer distance EV travel. A BMW i3 vehicle can charge up to 80% in just 20-30 minutes using a DC Fast Combo charger—about the time it takes to enjoy a cup of coffee or a snack. ChargeNow DC Fast, originally introduced in July 2014, resulted in the successful installation of 100 EVgo Stations with DC Fast Combo charging, throughout California, while providing BMW i3 owners with no-cost access to the stations. With BMW’s continued support, EVgo plans to install 500 additional DC Fast Combo chargers by the end of 2018, with more than 600 charging stations in operation. By the end of 2015, EVgo expects to have nearly 50 of the additional chargers installed, with at least one such charger in each market (excluding Portland).